The TV-tower is loved by pretty much everyone in Berlin. It’s always a lovely homecoming when I see him (he is male you know). He gives everyone a sense of belonging. You can believe how hard it is to walk by and not take a picture of it (him). 1. The government of the GDR needed to create their very own landmark of Berlin. 2. The construction of the TV tower during the cold war took four years from 1965 to 1969. 3. The official opening was on 3rd October 1969. Coincidental, the 3rd October today is an official bank holiday in Germany and The Day of German Unity. Who would have thought all these years ago? If Walter Ulbricht had known he would probably have tried to build the TV tower twice as high. 4. The TV tower stands right in the centre of the city at Alexanderplatz. 5. 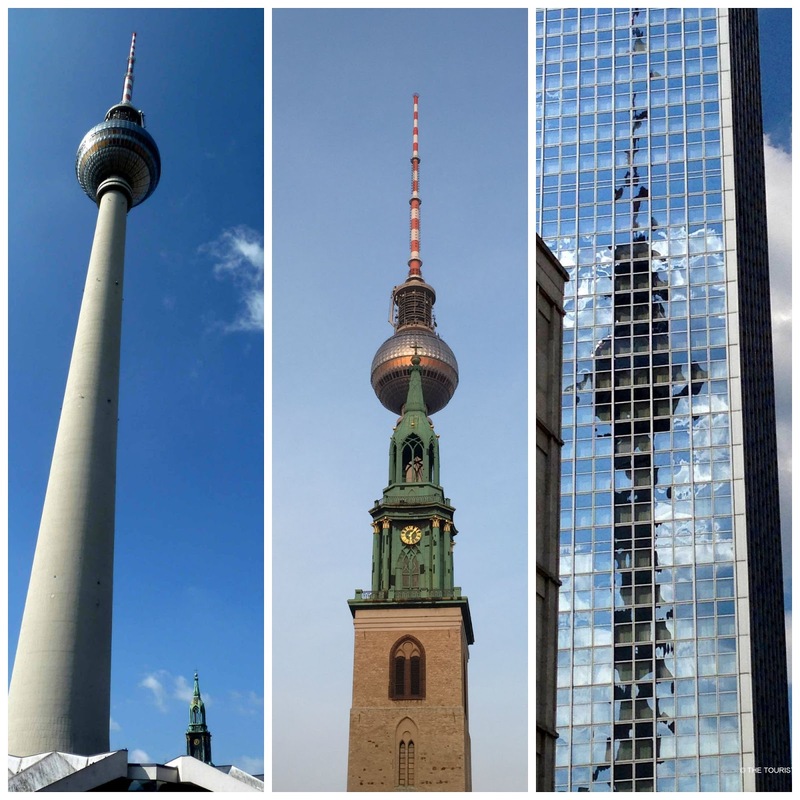 The 365 metre TV tower (plus a few metres of antenna) is Berlin´s highest building. 8. The lift needs 38 seconds to go up. 9. The staircase has 986 steps visitors aren’t allowed to use them. 10. Its silver disco ball on top is a rotating viewing platform and café. 11. The café is at a height of 207 metres and it needs 30 minutes for a full round. 12. The visitor platform is at 203 metres. 13. On a clear day visitors can look as far away as 42 kilometres into the distance. 14. The tower has no name as such, it is simply called TV tower. Some will tell you its name is “Tele-Spargel,” translated into English that would be “Tele-Asparagus.” So far I asked many Berliners for confirmation and they have never heard or used that name. So it might be a mythos. The TV-tower is somewhere in this pic - do you see him? There is one big downside when you visit the panorama platform and that is that you can’t see the tower from there. I bought my tickets here. Hi Sam, the gender thing is so very confusing indeed. For example a tower is female in Spanish (only if I remember correctly), and it is female in French too. No idea at all why the Germans think it is male. The spire (the antenna) of the TV-Tower is female in the German language, and also in French and Spanish. There are no rules, as in if the Germans think it is male use the opposite, this would be too easy.